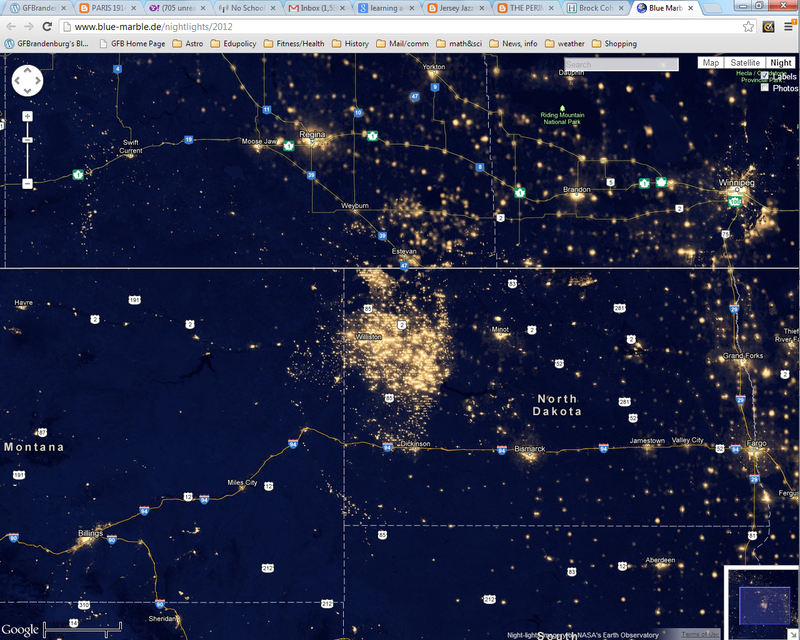 Can you figure out why is the northwestern corner of North Dakota lit up almost as bright as Manhattan? And if you would like to see, in detail, what massive light pollution, air pollution, and increasing the CO2 content of the atmosphere looks like, you’ve come to the right place. The map here is unique. I found it on http://www.blue-marble.de/nightlights/2012 which allows you to see what the world looks like at night. As you might expect, big cities and their suburbs are all lit up, and remote, unpopulated places are mostly dark. But there are some places way out in the boonies that are entirely toooo bright. Like northwestern North Dakota, as I hope you can see below. Part of that enormous blob of yellow in the center of the image is the super-bright lights on the oil rigs of the current North Dakota oil boom. The lighting, while probably rather cheaply and wastefully done, I at least understand. Drilling for oil in general, and fracking in particular, are dirty, dangerous and difficult jobs, and the work often goes on around the clock. Workers need to be able to see in order to be safe. However, I am sure that there are better lighting systems than ones that light up everything within 5 miles. But that’s not the majority of that light. Most of it is pure and simple waste. Instead of bottling or piping out the natural gas (aka methane) that comes up along with the black, oozing petroleum, they simply BURN OFF the gas. It’s a cold-blooded calculation by the corporate leadership: it is more profitable to them to burn up much of the gas than saving and selling it and using it later. So they light up enormous plumes that light up the sky, literally 24/7, adding humongous amounts of carbon dioxide to the atmosphere, and warming up the planet both directly and indirectly. And turning that part of the Great Plains into something resembling Dante’s Inferno. Oil companies say they are selflessly pursuing “energy independence” for the US. Don’t you believe it. They are selfishly pursuing profits. If they were really interested in simply producing more energy for the good citizens of the USA or wherever, then all of that gas would be bottled up or saved to be used later in our stoves, heating systems, factories, or vehicles, where people need it. Instead of burning it off for nothing. That’s capitalism in a nutshell. They are not wildfires caused by lightning strikes or other acts of nature, but the deliberate burning ofnatural gas by oil companies rushing to extract oil from the Bakken shale field and take advantage of the high price of crude. The gas bubbles up alongside the far more valuable oil, and with less economic incentive to capture it, the drillers treat the gas as waste and simply burn it. If you’d like to see close up photos of flaring, look at NYT here.